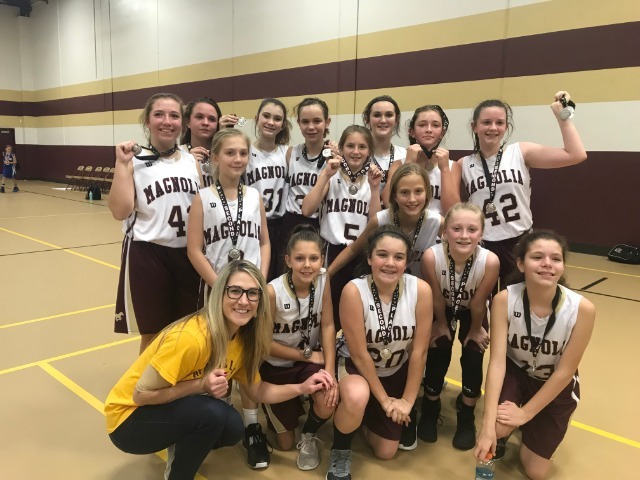 7th grade maroon team had an outstanding outing this past weekend during the magnolia tournament. Lady mustangs faced Brabham for their first game Friday night, coming out on top with a score of 20 to 13. Going into the winners bracket the girls then faced Tomball, taking the win 25 to 24. Sarah Barnes won the game with a free throw in the final seconds! Going into the championship, the mustangs faced bear branch bears coming up just short. Both teams went back and forth the entire game, losing by just one basket in the final minute of the game. Sarah Barnes had an outstanding tournament and scored over 6 points in each game. All of the girls did great and fought hard. SO PROUD TO BE A LADY MUSTANG! Good job girls!